Shakshuka is a Middle Eastern and Mediterranean dish of eggs poached in a sauce with spices, served for breakfast, brunch, or even sometimes lunch. Although the most common version includes tomatoes and peppers in the sauce, vibrant green versions are also popular. What constitutes green can be up to you, but spinach is the most common base. However, other hearty vegetables such as kale, Swiss chard, and broccoli rabe also work extremely well in this dish since the tough greens get the benefit of some simmering to soften them. Once the base green sauce is cooked, you can poach the eggs entirely on the stovetop or cook them in the oven for a few minutes to set. Ideally, the finished eggs should have set whites and still runny eggs to mix into the sauce and vegetables. Use your favorite bread to dip into the mixture and spoon out the egg-covered greens. Spices can vary, but are likely to include cumin and some form of heat such as red pepper flakes. Similar in style, Mexican huevos rancheros tend to have a very spicy sauce, whereas the Middle Eastern version can be mild or hot. 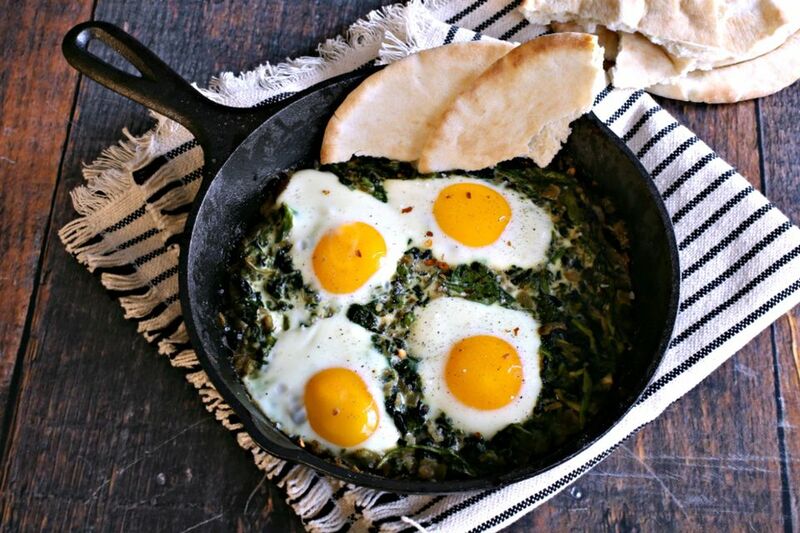 But feel free to customize this dish with your favorite spices and greens for a great egg breakfast. Gather the ingredients. Pre-heat the oven to 350 F.
Add the broccoli rabe to a large pot of boiling water and cook for 2 minutes. Drain and set aside. Add the tablespoon of olive oil along with the diced onions to a large oven-proof skillet or cast iron pan. Cook on medium heat for about 10 minutes or until the onions become translucent. Add the minced garlic and continue cooking for about another minute. Cut the par-cooked broccoli rabe into small pieces and stir into the onion and garlic mixture. Cook for a couple of minutes, then stir in the baby spinach leaves. Continue cooking for another couple of minutes, stirring often, until the spinach begins to wilt. Stir in the ground cumin, salt, ground black pepper, and milk. Make four wells in the mixture and crack an egg into each well, being careful not to break the yolks. Note that it is easier to crack each egg into a small bowl and then transfer to the pan. Place the pan with the eggs into the pre-heated oven and cook for 10 to 15 minutes until the eggs are are set to your liking. Sprinkle the cooked eggs with a dash of flaky sea salt and a pinch of red pepper flakes. Serve with crusty bread or warmed slices of pita or naan.